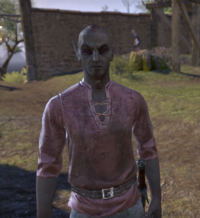 Andilo Barus is a Dunmer artisan who can be found in Vivec City. He is one of the laborers tasked with building Vivec City. "I haven't seen Lord Vivec in days. Do you think we've disappointed him? We're all trying our best, I swear it by the Three!" "I've never worked so hard in all my days, but Lord Vivec's worth it. I'm helping make the greatest city in the whole of Nirn!" "Lord Vivec actually spoke to you! Spoke! To you! Do you know how lucky you are? If I work harder, perhaps he'll speak to me too!" "Don't worry about Baar Dau, Lord Vivec has it all under control again. In fact, I was never frightened at all!" What's it like building the city? "This, my friend, is the start of a legacy for not only Vivec, but for us all! What an honor! What a privilege! My work is tribute to part of the Tribunal. I couldn't be happier with my work right now." This page was last modified on 20 February 2019, at 02:07.